My state's senator is up for reelection in 2020, and the Trump years have shown her constituents that her centrism is a pose. Geographically, Maine may have more than 35,000 square miles of land but, emotionally, we’re just one big small town. I saw Stephen King at the doctor’s office once. I saw Anna Kendrick at brunch. If Kevin Bacon was from Maine, his game would only have two degrees. Recently, I ran into Senator Susan Collins at an airport. 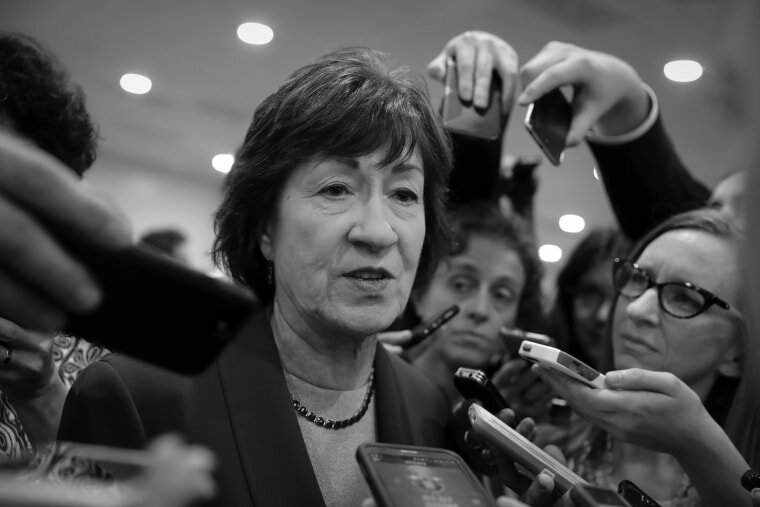 There’s a bit of celebrity that comes with being one of the most powerful members of the U.S. Senate; When people see Sen. Collins, they do a double take, they start whispering to each other and they even whip out their phones and ask for photos. She’s a point of pride for many Mainers because, in a state where headlines about Captain Marvel’s are always coupled with a note about how the heroine might be from Maine, Susan Collins is kind of a big deal. This isn’t the first time I’ve run into the senator but, in previous flights (and elevators, events and restaurants), I’d never approached her. I believed she deserved a bit of peace when out in public, and figured that nobody really wants to talk to a stranger on a plane. I was worried, in fact, I’d make her feel uncomfortable. But a lot has happened in the last three years. According to Time, Sen. Collins sided with Trump’s agenda 87 percent of the time in 2017. In her career to date, FiveThirtyEight says she’s voted with Trump 72.3 percent of the time — almost 25 percent more of the time than they otherwise might predict given how unpopular Trump is in the state she was elected to represent. Sen. Collins was the first person to speak in support of Jeff Session’s quest to become Attorney General. She supported the President’s tax overhaul bill. Thanks in many ways to Sen. Collins, Brett Kavanaugh has a lifetime appointment on the Supreme Court. And, while she made headlines this weekend for writing Attorney General William Barr a letter suggesting he ought not overturn the Affordable Care Act by administrative fiat, in reality, she did so while suggesting a way he could accomplish the same thing without running afoul of the constitution. When Sen. Collins does vote against the president’s agenda, she does so in a way that still allows for a Trump victory. Many Mainers — including me — visited her offices at the start of the Trump administration to ask her to oppose Betsy DeVos’ appointment to head the Department of Education. (That is the same DeVos who, last week, announced her intention to zero out contributions to Special Olympics’ school programs developed to help stop the bullying of children with disabilities and later was overruled by Trump.) Her phone lines were flooded for weeks by Mainers like me who opposed DeVos — and yet, Collins voted the nomination out of committee knowing full well that doing so was a success for Trump. When she ultimately voted against the nominee, she did so with the knowledge that the vice president would break a tie in the Senate and that allowed her to further Trump’s agenda with one vote while maintaining her moderate mantle with the other. Despite all of this — and none of this triangulation is new — the senator has been able to get away with a reputation as a moderate for most of her career. In an age when it seems as though half the laws members of Congress pass are censures of each other’s behavior, a moderate Republican is a welcome sight on anyone’s ballot. But no good can come from voting for a “moderate,” when they are a moderate in name but not in action. The last three years have been — politically — the most difficult Collins has faced. But instead of taking stock and listening to her constituents to better understand how she can best serve them, she gave the distinct impression that she found the opinions of her constituents at best inconvenient and at worst, a threat. (My husband, my parents, my son and I were some of the thousands of constituents who very politely pleaded with the senator to trust women, and reject the Kavanaugh nomination, but whose calls and visits she ignored.) She even complains that concerned citizens — her concerned constituents — are “overwhelming” her staff. And yet she gives these citizens no other place to reach her, like town halls, for example, which she’s long refused to do. So, a constituent like me is left with one option: Summon the nerve to speak to her at an airport. The discomfort that I once worried the senator would feel if I approached her is nothing compared to how I feel every day knowing that Brett Kavanaugh is on the Supreme Court. I have the utmost respect for the office that Susan Collins currently holds, and it is with that respect in mind that I approached her and told her that I believed Dr. Christine Blasey Ford. I told her that I was a sexual assault survivor. I thanked the senator for her service to my state, but told her that I was so deeply disappointed in her record over the last few years. I told her how triggering it is for me to wake up every day knowing that both Kavanaugh and Clarence Thomas sit on the bench. Sign up for THINK's weekly newsletter! To her credit, the senator did treat my concerns with respect, but she repeated many of the same lines as I heard in her 45-minute long profession of love for Brett Kavanaugh. As a woman, a mother and a survivor, I wanted to hear the senator tell me that she trusts and believes women, but she told me instead that she found it strange that Dr. Ford’s parents didn’t come to support her when she gave testimony, and how odd it was that Dr. Ford couldn’t remember how she got home that night. Thinking like this makes it so difficult for survivors to come forward, and I was aghast that Sen. Collins could possibly think that this line of thought was justifiable. I can’t fault the senator for believing what she believes; she is entitled to that. But I do find fault that whenever someone attempts to criticize her, she trumpets her repetition as a centrist. It’s a reputation she no longer deserves. Sen. Collins is up for reelection in 2020 but, regardless of what slogan her team may promote, voters in Maine will remember that, when her constituents needed her most, she was not there for us. And she probably never will be. Joy Engel is a freelance writer and strategist whose work has appeared in Cosmo, Elle and The Decider. She lives in Portland, Maine.